Remember me, kiddies? Yes, it’s been a long time since we’ve had any news on the ol’ website: times have changed since the glory days and most internet dwellers have migrated to social media for their comics, news, ads, “human interaction”, and whatnot. Even though most of what’s been going on with SCAPULA has been happening at the Patreon group, the Facebook art page, and a bathroom stall at Del Taco (just make sure you pick the right stall…), I’ve decided that it’s time to get some new stuff going around this site for old times’ sake. Hey, Lady Jenn sure wouldn’t have been using Twitter! 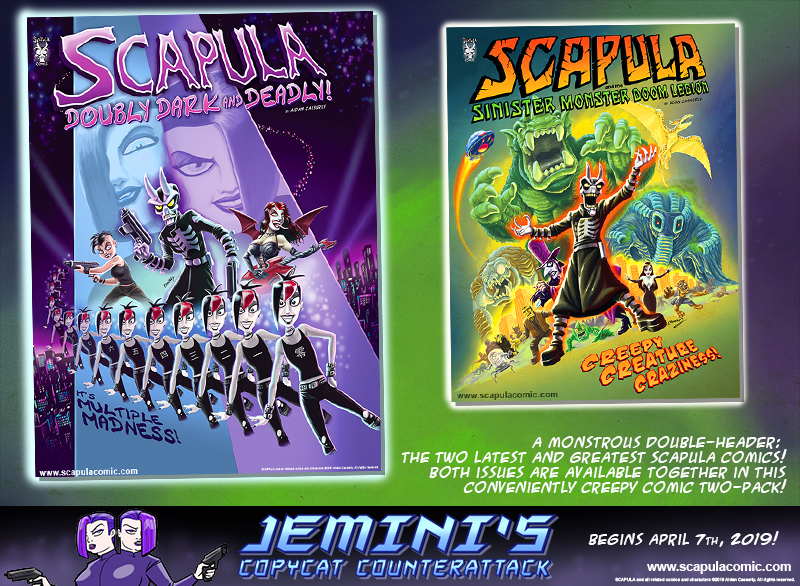 For those who don’t know, the latest issue of SCAPULA was published after a rough-but-successful Kickstarter campaign. The new issue is now available as a two-pack with our last monstrous comic, Scapula and the Sinister Monster Doom Legion. You can grab both new comics together for a low price (along with some extra surprises); just click the pic above or visit the Scapula Store at the top of this page. Is that all? Nope! As is the custom around here, I’ll be posting one of the stories from the new comic here on this site to read for free. That’s right, we’re going back to our ancient custom of a new comic page every Sunday! While I’ll also be posting the new pages on Facebook it will also be nice to see some comments here again, as they are one of the main reasons I even keep this old site around. Here’s hoping you kind folks will be back in April, as we begin the next big tale of terror (and idiocy)! As an old fogey who isn’t hip with social media, I’ve kept your feed in my rss reader hoping for just such a day! Our first new commenter in…hell, FOREVER! Welcome back, Skjie, and here’s hoping you’ll enjoy the upcoming story (and keep ignoring that Facebook ad on this page). I never know what F’book will put in my feed, but if I come to the website then I know I’m going to find Scapula. Welcome back, Herb! I think we all are going to find Scapula…to be an utter disgrace! Aaaaaaaw, hell yeah! I missed this place. Fits like an old pair of slippers. Heck it even still autofills my name! I’ve never let it get off my most visited top ten… I think eighth was as low as it’s gone lol. Looking forward to fresh comics! It’s like coming home again…and home is still a total mess, with broken furniture and liquor bottles everywhere. Just like how Lady Jenn left it! Yep, sounds like her! She liked to play rough with her toys. Geez, they’re still finding guns and ammo and whiskey she had stashed at her various places of residence. Last I heard her adopted son Jack had found a security chest of ten handguns and a sealed bottle of Jack Daniels in a dresser drawer in mid-February. Man, I miss her. And you’re right, she’d never have used something like Twitter… she was always one on one.